We all love our jeans to pieces, don't we? I mean, literally, we often wear them until they're ripped and torn and stained because the more worn-in they are, the more comfortable they are! 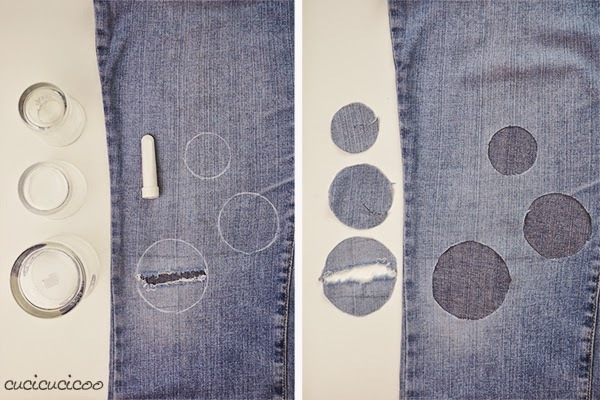 When faced with a pair of jeans with a rip, I generally just machine darn the hole to repair it. (Here's my tutorial on machine darning.) But sometimes you just get the urge to add something fun to your clothing, or you need to cover up a stain. In these cases, you can let your imagination go wild and jazz up your jeans with these creative patches made with reverse appliqué! 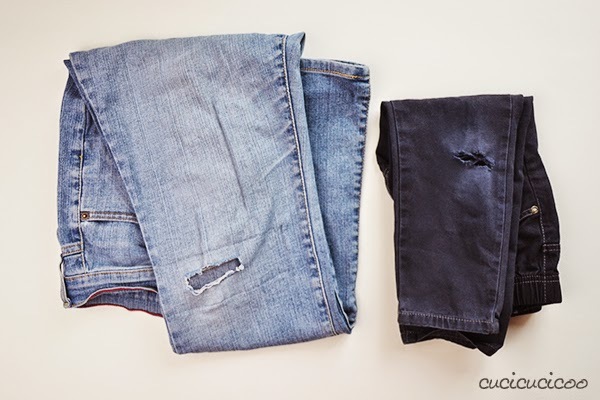 First, grab all your jeans in need of some TLC. Cut out some strategically-placed shapes. Prepare the patches. I like to overlock the edges so that they don't fray. Pin the patches under the hole on the inside of the leg. 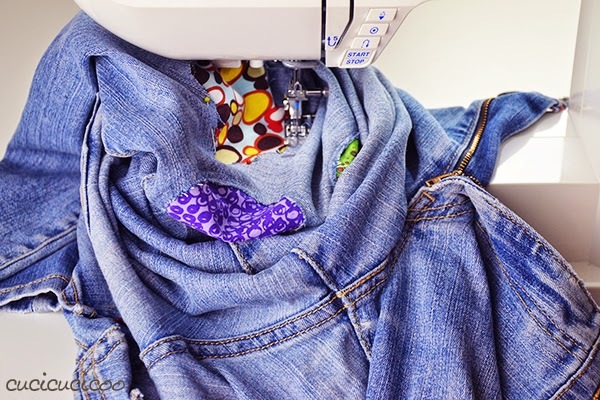 Then sew them in place by machine. 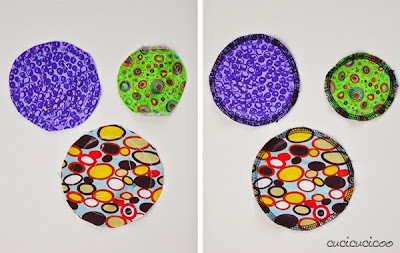 It can be a little tricky to machine sew patches in the center of pants legs, especially if they're kid's pants, so you can also hand-sew the patches in place. 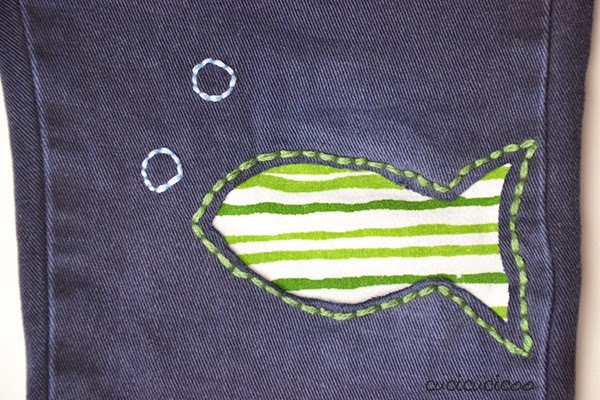 When I do it by hand, I use embroidery thread to add to the colorful effect. 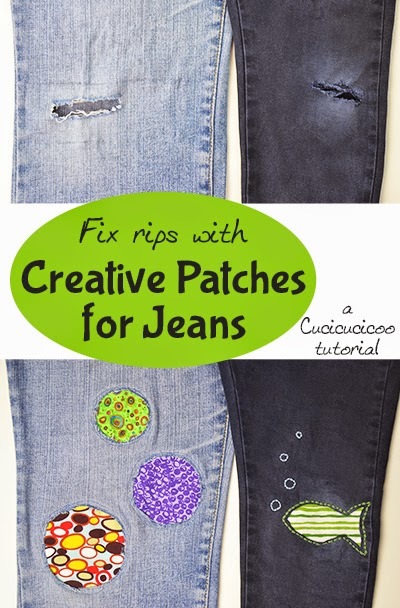 If you want to learn all the details and tricks on how to make these creative patches, just head on over to my blog, Cucicucicoo, for the full tutorial! 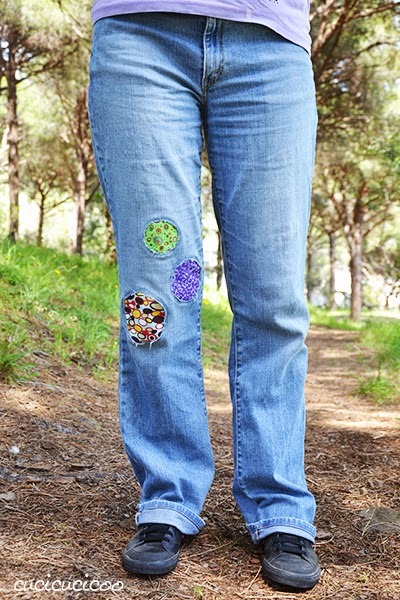 Patch up holes in jeans with fun and colorful reverse appliqué! A Cucicucicoo tutorial for Refashion Co-op! I love that fish! Great idea for a different way to fix holes. Cute patches! You are right about us loving our jeans to death!